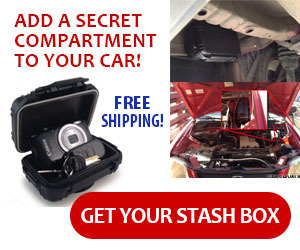 We found this custom crafted secret compartment on the BlokeBlogger‘s site. Here he creates a tiny secret drawer in the face of an actual drawer. The small compartment can only be accessed by first pulling out the main drawer, then using some type of push stick to press it out of the side. This Victorian writing box available on Etsy contains compartments for writing equipment, as well as 3 secret drawers hidden behind a panel. This antique secretary desk is for sale on Ebay and houses two vertical secret compartment drawers that are hidden between small columns in the desk.